"The Best Cookies You've Ever Made"
I had originally discovered these cookies in the midst of distracting myself from studying for finals. The idea of lavender and white chocolate had me drooling in the library. I couldn't wait to get home for the summer to make these! The lovely Rachel over at Spache the Spatula first made these cookies. Go check out her site because all of her recipes are seriously nom worthy. I knew I would love the flavor combination of the cookies, but I was a little nervous at what other people would think, especially boys, especially my dad. He has a broad palate but usually likes to stick to the basics when it comes to cookies. To my surprise, they were a hit! My dad even claimed he thinks they are the best cookies I've ever made! They are unusual, but absolutely amazing. The have a really gourmet layer of flavors that anyone would love! These are the perfect spring or summer cookie and would be great at any kind of shower or party! I had never made anything with lavender before, but I've always loved the flavor. I found a small pouch of lavender buds at Sprouts on an end cap with other peculiar spices. Although, I'm sure you could find them at most specialty or organic grocery stores. I love the way Rachel combines the lavender and sugar in a food processor to really perfume the sugar and to insure the lavender gets spread throughout the dough. The only change to the recipe I made was using chips instead of getting a bark of chocolate and chopping it. I just add the chips directly to the electric mixer and let the mixer chop the chips up a little. The cookies are finished off with a sprinkle of sea salt and extra lavender to really balance out the flavors. I was so pleased with these cookies and so was everyone who tried them! In a bowl combine flour, cornstarch, baking soda and salt; set aside. In a food processor, process the sugar and lavender for a few seconds until the lavender is chopped into tiny pieces and sugar starts to "smoke" out of the processor. This step perfumes the sugar and ensures that the lavender will be evenly distributed within the cookie! In an electric mixer, beat together the butter, shortening and lavender sugar on medium for 3 minutes. Add in the egg and egg white and beat for 3 more minutes until fluffy. Add in the flour mixture slowly and white chocolate until combined. Using a cookie scoop, generously scoop oversized balls of dough onto a parchment lined baking sheet, then preheat your oven to 375 degrees. While the oven is preheating, place your sheets of dough in the freezer to let them firm up. Once the oven is ready, bake your cookies for 12 minutes. 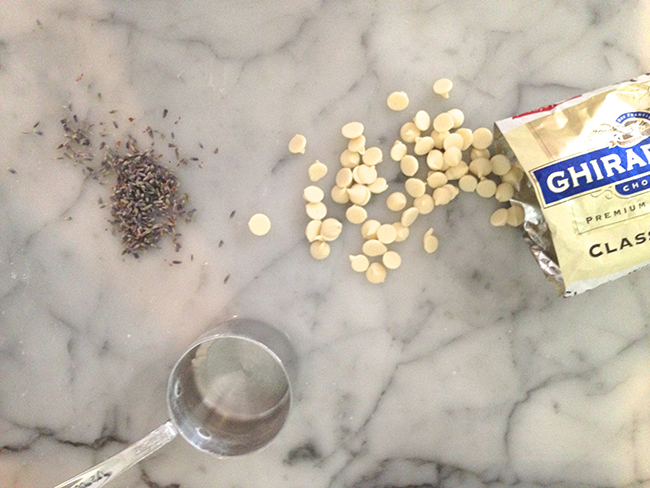 To use up the rest of your lavender, try this vanilla lavender granola recipe!